We started with our welcome song, followed by our story song. 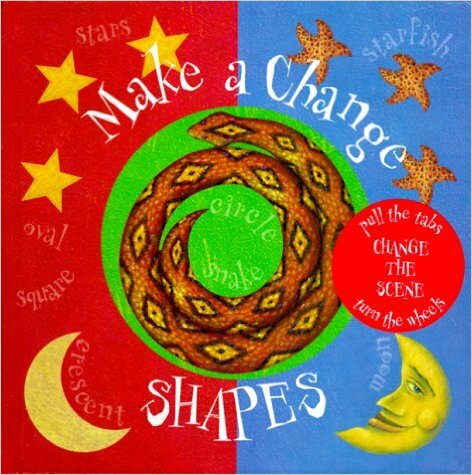 For our first book I chose a little gem that I snapped up from a cart of books the children's department was discarding from their office storytime collection (I'm in outreach), Make A Change: Shapes by Margot Thompson and Geff Newland. 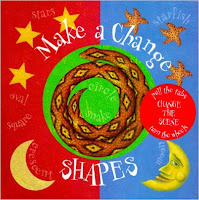 This is such a fun book for talking about shapes, with wheels to turn, tabs to pull, flaps to fold, and pop-ups! Watch as a snake slithers out of the page to coil into a circle, an chick hatches out of an oval, a rainbow arc appears, a triangle roof tops a fairy cottage, and discover a pyramid (square base and triangular sides) complete with a mummy in his rectangular sarcophagus, followed by sea stars and the Man-In-The-Moon! Even the endpapers have something to offer; the front has several shapes that can be magically turned into a different shape by folding in the flaps, and the back offers a turning wheel that reveals different shapes to identify. (Unfortunately, there were very few copies of this book sold in the states, and it is now out of print). "Do You Know What Shape This Is?" Since our songs did not have a lot of movement in them, I had everyone stand up, give a good stretch and shake their wiggles out, before quieting our bodies and sitting back down for the next story. 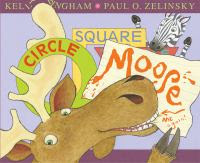 Our second (and final) book was a really fun, silly one that I just happened to come across straightening up the stacks a couple of weeks ago, Circle, Square, Moose by Kelly Bingham and Paul Zelinski. This book starts out to be a simple, straightforward shape book, illustrating various shapes with everyday objects, until Moose decides to insert himself into the story, painting out some words and adding "Moose" in their places and running amuck. He eats the sandwich that was supposed to show a square, brings along a cat, gets everyone tangled in the ribbons that were supposed to show curves, and ruins the story. Even Zebra can't get him under control, and sadly laments that the story was ruined and has no ending. But, Moose manages to partially redeem himself by coming up with a rhyme for the last shape to end the book. Then we sang our closing song and passed out stickers, which were special "I Love My Library" stickers in honor of "Love Our Libraries" month. I pointed out to them how each sticker had three shapes: the square backing, the round sticker, and the heart in the center. We had a very fun, slightly boisterous, storytime today! Who knew shapes could be so exciting? This group always loves calling things out, and I have noticed every time I've done the "Do You Know What Shape This Is?" song with this class (even with different kids each year), they tend to get louder and louder with each successive shape. I shut the door as a precaution, and tried to rein them in, but they just couldn't contain themselves. But, I'd rather have the problem of too much enthusiasm over a group of kids who just stare at you with blank faces while you can hear crickets chirping any day! They really liked the first book, and I remembered just as I was about the bring the snake out that their teacher really hates snakes and won't even look at them. This is well-known among the kids and they LOVE to indulge in a little good-natured torture by making sure to show her EVERY picture of a snake they see, so they all laughed when they realized what it was. But then some of the kids decided they didn't like the snake that much, either, and thought I should unwind it back inside the page before moving on. They were amazed by everything that appeared, especially the mummy. It is such a shame this book is almost impossible to find now, even used. I'm glad I was able to get my hands on a copy. They absolutely loved Circle, Square, Moose and really got into it; I had a lot of fun doing it as well. This is probably one that most people would need to practice a little first to really make the most of it, and would be great to do with a partner voicing the moose (especially if they were wearing antlers!). They kids laughed and giggled so much, and got a kick of being able to tell Moose to get out of our book, and I was glad to see they recognized how wrong is was to write (or paint) in a book. I only read two books this time since this one is a little on the longer side, and even though the first one is short, it always inspires a lot of discussion. As I was leaving, one little boy ran after me, saying "Wait, you gotta give me my hug!" Have I said how much I love preschoolers? I do like to do programs for other ages as well, but it's hard to beat the innocence, enthusiasm, and adoration of preschoolers! 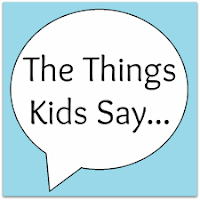 As anyone who has spent much time around kids knows, they can say the darnedest things! From brutal honesty to fanciful, detailed stories to revealing family secrets, you never know what they're going to say next! For some reason the theme over the last two weeks inspired many unexpected comments from the kids; so many that I was inspired to dedicate a whole post to share them! 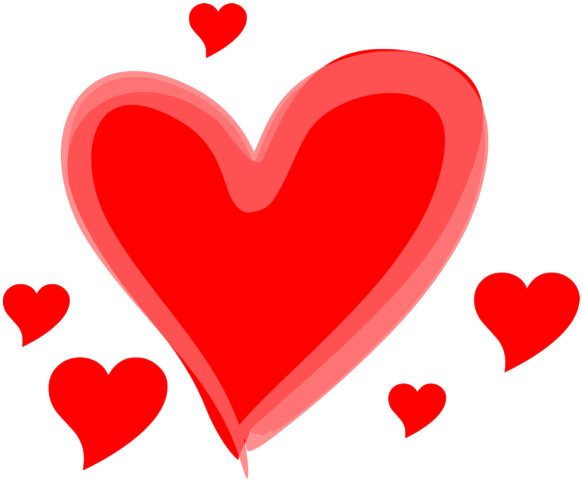 For the last two weeks of the Storytime-To-Go program we have been doing a "Love" theme, which has some Valentine's Day stories, as well as several general stories about love, hugs, and kisses. 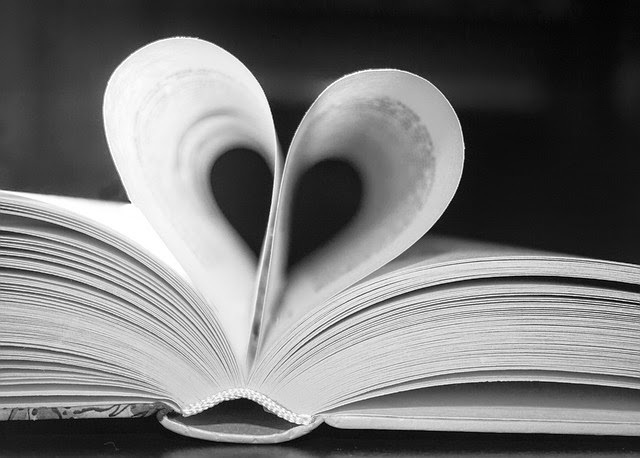 I usually start out by talking about love, how we can love different people (or things) in different ways. The kids usually start by first saying they love their mommies and/ or daddies. But one day it didn't quite go the way I expected, revealing one family's dirty laundry. One little girl (whose parents I have gathered are recently separated from other things she has said) comes out with "I just love my daddy. I don't love my mommy because she punches my daddy." There was a slight pause as we (the teacher, my volunteer, and I) exchanged slightly panicked glances, then I just moved on as though I hadn't heard anything unusual. It made me sad to know that she had witnessed her parents having a physical altercation. It goes thump, thump, thump. It beats even faster when I jump, jump, jump. That makes me want to give you a hug, or two! I lead into by asking them if they know where their heart is, and what it does. Then I explain about how the beats are the heart squeezing to pump your blood throughout your body. One little girl pipes up with, "My mommy pumps to feed my baby brother!". The adults laughed, and the male teacher looked just a wee bit uncomfortable. I told her that was a different kind of pumping and moved on! And that was followed up by some brutal honesty in the next group. At the end of each session, our driver (who happens to be around 75) hands out stickers to the kids. I always tell them, "That's all the time we have for today, but if you would like a sticker, you need to stay seated, criss-cross with your feet our of the way so (driver) doesn't trip. We don't want (driver) to fall and get hurt!" To which one kid replied, "Cuz he's old!" and another kid piled on with "Yeah, he's *really* old." Of course they aren't meaning to be rude, simply stating a fact, and fortunately our driver has a sense of humor about such things! Earlier this week, one child told something on himself. I was reading Froggy's First Kiss and got to the part about everyone teasing Froggy and saying, "Froggy has a girlfriend; Froggy has a girlfriend". I always stop and ask the kids if that was nice for everyone to tease Froggy, and they always respond "No!". Then one little boy volunteered that his older brother teases him and says that Sally, a girl in the same class, is his girlfriend, but she's just his friend. Fortunately the girl in question didn't seem to mind and laughed about it. Sometimes what they say is incredibly sweet. While reading Love Monster, we observed how the monster was sad because people only want to cuddle with soft, fluffy things like kittens, puppies, and bunnies, and no one wanted to cuddle with him. A very empathetic young lady stated adamantly that "I would cuddle with him!". 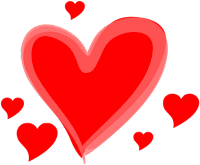 But best of all was on Monday, when we were talking about who we loved, and one precocious little boy said "I love Mr. (driver) and I love you! And you're pretty!" [Insert collective "Awwwww" here.] And that my friends is why I love my job! No Theme, Just Lots of Fun with New Books! I knew I wanted to use an awesome new book, Chicken Story Time, this week, and at first I toyed with doing a whole chicken theme, but then I saw a couple of other new picture books that looked like a lot of fun that I really wanted to try, so once again I went theme-less! 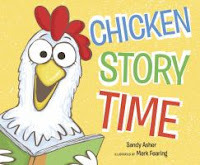 So after our welcome song and story song, we dove right into Chicken Story Time by Sandy Asher and Mark Fearing. So this story starts with one chicken deciding to drop in on storytime at the public library. But then, the next week more chickens come, and the following week even more chickens come! What's a librarian to do?? The story is cute, and the illustrations are wonderful, clearly conveying what it going on. I can't imagine a children's librarian or storytime attendee that wouldn't love this book! was a little unsure if kids this age would get it, especially after my mentor said it didn't go over so well when she read it to a kindergarten class. This is technically not new, as it was published in 2015, but it is new to our collection so was on the "new" shelf. 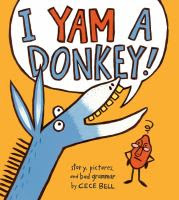 In Cece Bell's I Yam A Donkey! we find a highbrow spud of the sweet variety attempting to correct a donkey's sloppy grammar, but the donkey misconstrues everything the yam says, to the yam's increasing frustration (reminiscent of the Abbott & Costello "Who's on first?" bit). The yam enlists some of the other vegetables to help him demonstrate proper subject-verb agreement. In the end, the dense donkey *finally* gets it, but it does not end well for the vegetables. I made sure to give this a good set-up prior to reading to help ensure the kids would get it. Since our last book incorporated movement, I just went straight to it, rather than do an activity first. 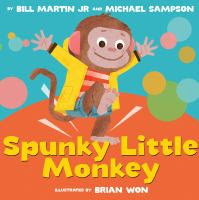 Spunky Little Monkey by Bill Martin, Jr. (posthumously), Michael Sampson, and Brian Won is intended to encourage children to exercise. We start with a sleepy little monkey who is having hard time waking up at first, then pops out of bed. The rhythmic text (borrowing from "Five Little Monkeys" and other childhood clapping rhymes) leads us through various motions: bobbing heads, clapping hands, stomping feet, and shaking hips, all to the rhythm of the beat. I only wish it was just slightly longer and then wound down at the end for an easier transition. I meant to do "Five Little Monkeys Jumping On A Bed" after this, but I completely forgot and went straight to our closing song, and passed out monkey stickers. I had another fairly big group today, with 18 kids and three adults, and I think we all had a lot of fun and really enjoyed these books. Chicken Story Time was probably the kids' favorite, as they could easily follow what was happening and relate it to our own storytime. We talked about whether we would want all those chickens in our storytime, and some of the kids said yes, and others said no, and all agreed that the teachers probably wouldn't like chickens in the classroom! And as expected, they had lots of fun with "I Know A Chicken" and the shakey eggs, and several commented on how much the liked it afterward. After hearing that I Yam A Donkey! had not worked well for the kindergartners, I had second-thoughts about doing it with the preschoolers, but I liked it so much I had to give it a try. I made sure to give it a good set-up so they would have some context by talking about how it can be really frustrating if we are trying to tell someone something and they just don't understand and keep getting it all mixed up. Then after I read the title, I asked them "Is that how you say it? 'I yam a donkey'?" And several said "No", then i asked them how you should say it, and several did reply "I am a donkey". I'm not sure if they completely got everything about the story, but they seemed to get most of it; they definitely understood the donkey was misunderstanding everything and the yam was getting extremely frustrated, and thought that was very funny. They always enjoy stories that break from the traditional "criss-cross applesauce, hands in your lap" and let them move around, and Spunky Little Monkey was no exception. It did seem just a little bit too short, though; I think we could've used two more spreads of action. I liked all the books, but I think I had the most fun with I Yam A Donkey! I usually use themes just for my own convenience, to give me some direction, but not always, and the kids never notice the difference. All in all, it was a very fun, and funny, storytime!